If you missed me sharing about that one decision staring me down, you may want to read about it before you read below. This summer has been totally crazy, even though I tried to prevent the crazy from coming, it came anyways. After I wrote my previous blog post, I finally had some time to actually talk to my husband without children interrupting us. We had an entire afternoon and evening together where we could just talk and have complete thoughts. Let me relish that for a moment…that was the best! During this time together, I presented to my husband my plan for taking my current students online this year. I wanted to transition everyone to a hybrid experience where we do some in-person tutoring and some video tutorials created by me. The plan included me meeting with them every other week in a group setting. As I described in more detail, my husband listened intently and asked super smart questions like, “How long will creating a single video take? How will your students receive this hybrid experience? What are some of the costs associated with this plan?” I was prepared with great answers as I had done my homework! After taking it all in, he softly shook his head and said, “No. I don't want you doing this.” Before you jump to any assumptions about my husband, let me just say he has been very supportive of me tutoring and then creating The Tutor House. He sees all the hours I work and yet he continues to support me. Every school year, he begs me to take less on…but as you can guess, I have a hard time turning down more students or creating projects for The Tutor House. We have been married for 15 years (it was young love) and so for him to tell me straight he doesn't want me to take on this new endeavor was something I needed to stop and listen to. So I did. I was stunned into silence for a bit. After I soaked it in a little, my husband shared more on his perspective as to why he doesn't want me shifting my tutor business this way. Our boys are entering that special stage where they need mom to be their chauffeur. Last year, they got involved in more activities and it was hard to juggle tutoring in addition to running my children around. 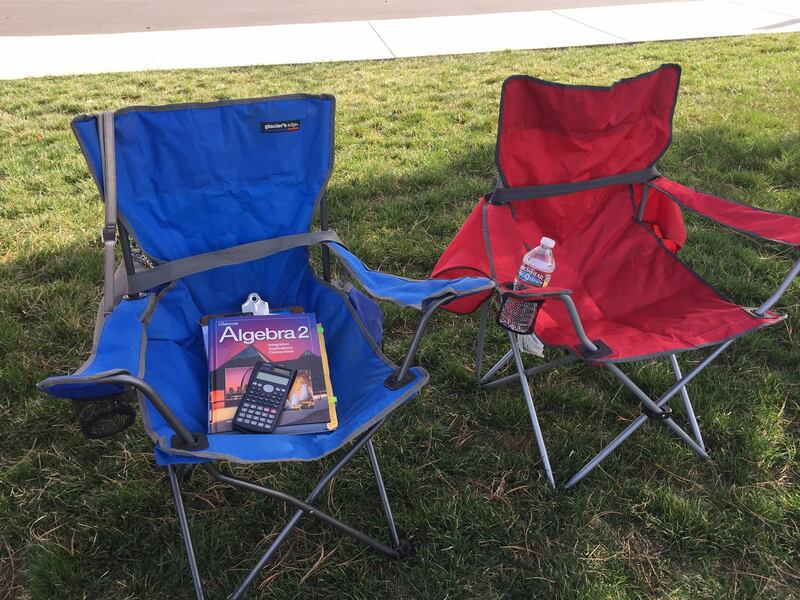 I even found myself tutoring at the park during football practice. Now that's dedication! We made it work, but at the end of the year we were all stressed. My husband brought this all back to my mind and reminded me that this season in life is short. He was not saying I had to leave tutoring and never come back. He was saying, “not right now.” After our children are through this stage, I can totally come back. He sweetly said, “The nice thing is you would know exactly what to do to get back into tutoring.” True, I can't argue with that! My husband is very wise though and recognized it would be hard to turn tutoring completely off. We decided together that I would only do group tutoring one day a week at two different times. Our school year is fast approaching and I knew I needed to let parents know sooner than later. When I sat down to write that email, I needed strength as I felt at a loss for words. My husband helped me get started writing the email. I added a few key things he left out and then sent it out. My email was quiet for a few hours and then the responses started coming in. Students started to drop out of tutoring! I was seriously sad. Turns out parents want the best for their children and group tutoring was not a good fit for some and for others it was the time of day. Out of ten students, I was down to only two that were dedicated to group tutoring. Can you guess what happened? They signed up for different group times. Ugh. I am going to ask one student to move to the other time and if he can't, I guess I am completely done for now. I can't believe I just typed that! This defeats the purpose of group tutoring for me. If anything, this experience has taught me that there will always be a high demand for tutors. It feels strange to not have tutoring as part of my back to school plan. In spring of 2006, I would have been tutoring for a decade. Wow! That's nothing to shake a stick at. Fear sets in that somehow I won't be relevant to our community of tutors. I am hopeful that many of you would have made the same decision if you were in my shoes. I also believe that you value experience, which I have and enjoy sharing with you. I know that I will have mountains of ideas floating around in my head for how to teach various math topics as I work with my own children. To help me stay more focused at home, I have a special notebook where I can write my ideas and save them for the future when I can try out the hybrid tutoring experience again. Are you wondering what this decision means for The Tutor House? It won't affect things here. I can serve and support tutors while my own children are at school. You, my tutor friends, will still very much be a part of my life. I have big plans for us, but now I'll have the gift of time to bring them to fruition without these plans becoming a burden for my family. Thank you for joining me on my journey here. I adore seeing you grow as a business owner. I love seeing you give yourself value and watch you do amazing things with your students. Thank you. Ugh! Forehead slap! How did we misunderstand each other so badly? He told me that all he cared about was that I wasn't tutoring in the afternoon when the boys are home. From 9 am – 3 pm he doesn't care what I am doing. At that moment I wanted to scream at the sky. I am sure conversations like this happen in your relationships too. But the reality is that I still need a slower year to adapt. I have BIG plans for online tutoring and this year will be one of transition as I plan out what that will look like. I am thrilled to say I plan on taking all of you virtually along for the the ride via the blog. So make sure you are following via newsletter. It's the easiest way to keep up. Thanks for supporting me through all of this! Thanks for sharing this conversation with us, Adrianne. I’m glad that you are keeping The Tutor House running! To everything there is a season. It is true. And you can’t experience all the seasons all the time. Or you wouldn’t be able to appreciate any of them. Thanks for sticking with the tutor house. I remember the years of after school activities. It is important to be there. It will go by quickly. I just happened to come across an old “baseball card” picture of one of my kids. I was team Mom. I still have the mug. Enjoy it! Thanks for sharing. This is something many of us with school age children have ro consider. It is a tough decision. Words can’t express my gratitude for your support! I consider you tutors my friends and it was hard to admit that I really can’t do it all. But as each day passes, I feel more calm about my decision.